"Danish Village, Near Portland, Maine." General view of Danish Village, Scarborough, Me. (1930 - 1970). "This exact duplication of an actual Danish Village was brought to this country by Mr. Rines, owner and administrator, from his European trip." 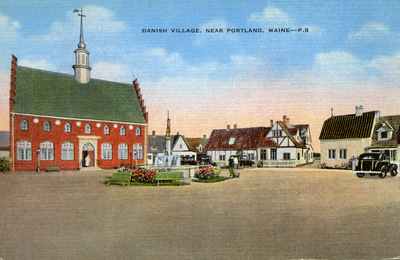 Printed by Atlantic Post Card Co., Portland Me., and St. Petersburg, Fla.
"Danish Village, Near Portland, Maine." (2017). Portland Postcards. 36.